Trying to throw an epic unicorn birthday party? What a fun and colorful way to celebrate your little one! 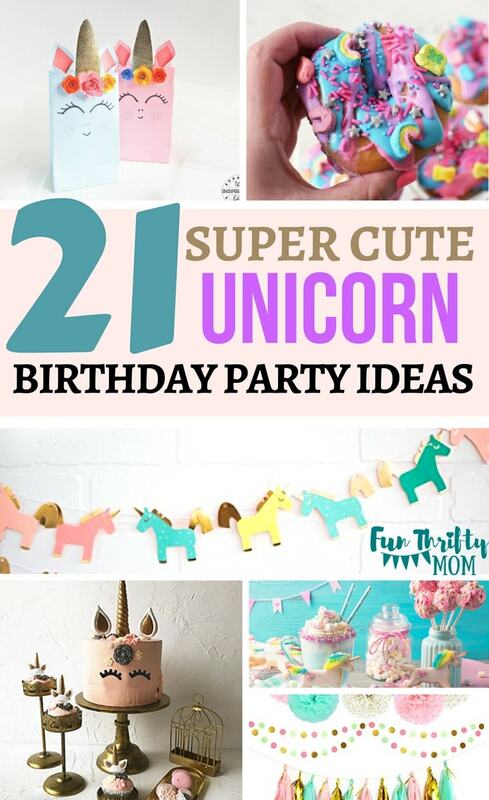 Here are some of the best unicorn themed birthday party ideas we could find to help you throw the most epic party ever! I am in love with this simple, but gorgeous birthday cake that still screams "unicorn party!" You can even watch the video tutorial on how to ice a cake like this over at Preppy Kitchen. This cute cake can be easily recreated with this little cake topper set. You can make a simple cake and stick on the gold and white pieces to make an easy, but pretty cake display. 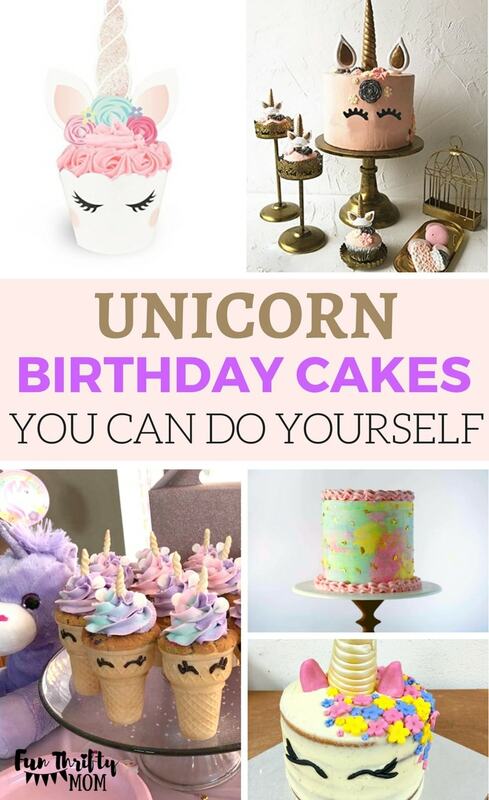 Baking Queen 74 can show you how to bake this sweet unicorn cake. I love the idea of using flowers as the mane. 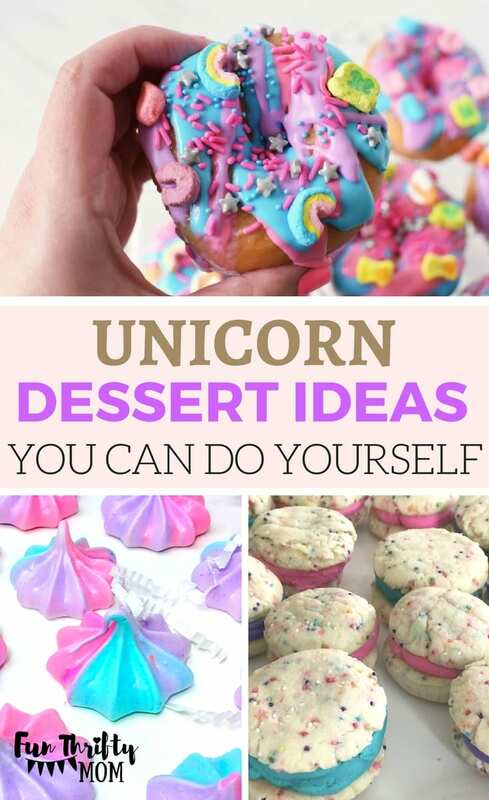 These cute Unicorn cone cupcakes are sure to be a hit. Check out My Heavenly Recipes to get the step by step tutorial for these cute little desserts. I love the idea for indiviual cakes like these if you are planning a small intimate party. These cupcake toppers take ALL the work out of cake decorating. Simply make your cupcakes and stick them in these cute cupcake holders and place on the toppers. Best part, this unicorn cupcake set is super affordable. Thes fun and bright colored unicorn poop cookies are sure to be a tasty hit at any birthday party. They are fun and novel. I think all kids will get a giggle out of being served "unicorn poop." 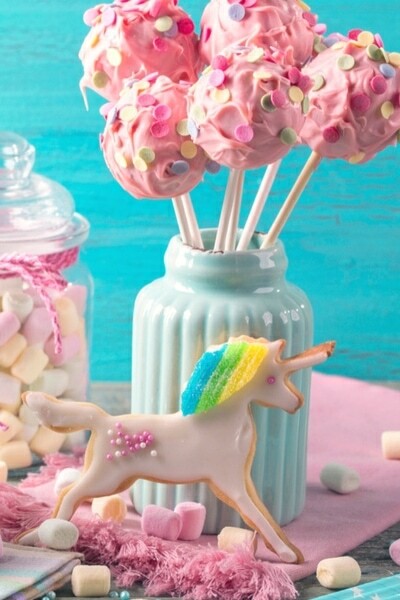 These Unicorn Cookies from Saving You Dinero are cute and quick to make using a box of cake mix! I love that you can customize the icing colors to fit any color scheme you may be using. Looking for a fun, unusual and super easy form of a unicorn birthday cake. 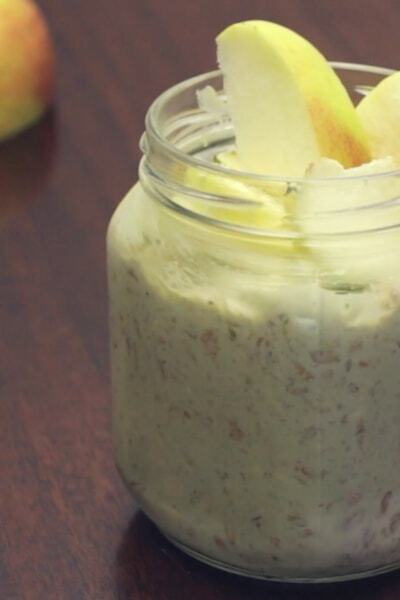 The Savvy Saving Couple has a genius idea. Simply buy some glazed donuts and decorate them! Check out how they made these beauties here. I love the idea of a little unicorn bookmark added to a place setting or as a little non-candy treat for a goody bag. You can get the free printable and tutorial over at Mommy Musings! These inexpensive masks are a great alternative to birthday hats or more pricey unicorn headbands. They are cute, and could even be added to your little gift bags. Another great set of printables from Simple Every Day Mom. These unicorn coloring pages are perfect to put out for children who are waiting for everyone to arrive or in between activities. A fun and functional party favor AND activity. This would make such a fun parting gift for the kids and give them a special memory of something they are not usually allowed to do, color on their clothes. Consider adding some coloring T-shirts for lasting memories. This pin the horn on the unicorn game is perfect to keep the kids entertained! It doubles as a cute decoration and a fun activity. The little girls in my life LOVE having their photos taken. These unicorn themed props would keep them entertained for hours, plus give them a permanent keepsake. A unicorn ring toss game is a great party activity for kids to play! What a cute and easy way to entertain their guests without creating a big mess! Win for mom too. This little DIY unicorn centerpiece is cute and easy to make! It would look great as table decor, and then would be a wonderful little decoration in the birthday girls bedroom after the party too. Get the tutorial at Mommy Musings. This cute little unicorn pinata is another dual functioning party piece. 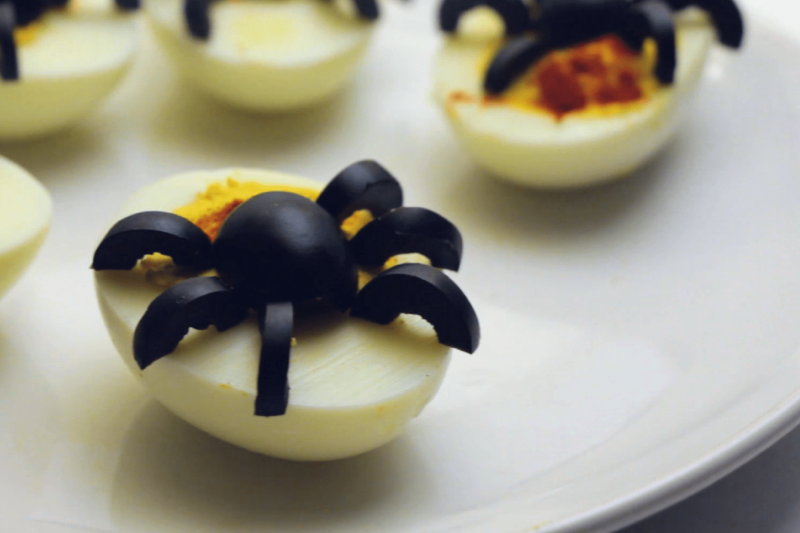 It serves as party decor and as a fun activity for the kids. This one is my personal favorite, but it is a bit small. They have other great ones here and here if you need something bigger. I adore these little printables from Simple Every Day Mom! You can get an entire set and have your birthday party ready to go. Invites, thank you cards, wall decor, games. (Too much stuff to list it all!) Simply print, cut, and decorate! 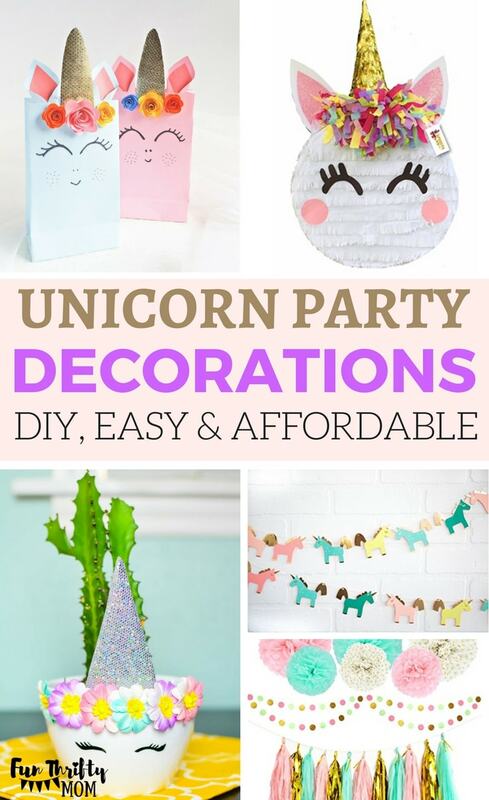 This pretty unicorn colored decoration kit would be perfect to transform any room into a festive party space. This sweet little unicorn banner would be perfect behind a photo station. Its cute and unique, and the birthday girl would probably love this over her bed after the party.